The line turned pink! Your family will soon welcome a bundle of joy and life will suddenly start moving a light speed. How will you capture these special moments? It is no surprise that my answer is through professional photography! When these precious moments pass, your photographs will help you remember all the details so easily forgotten. Some families choose to document the pregnancy through gender reveal and maternity sessions. Mini sessions can be added to any newborn session. Maternity sessions are usually held between 30-34 weeks of pregnancy. For the best chance at capturing the sweet sleeping angels, newborns are photographed at 5-14 days old. Contact the photographer as soon as possible to set a tentative session time based on your due date. The session may be moved if the baby comes earlier or later than expected. 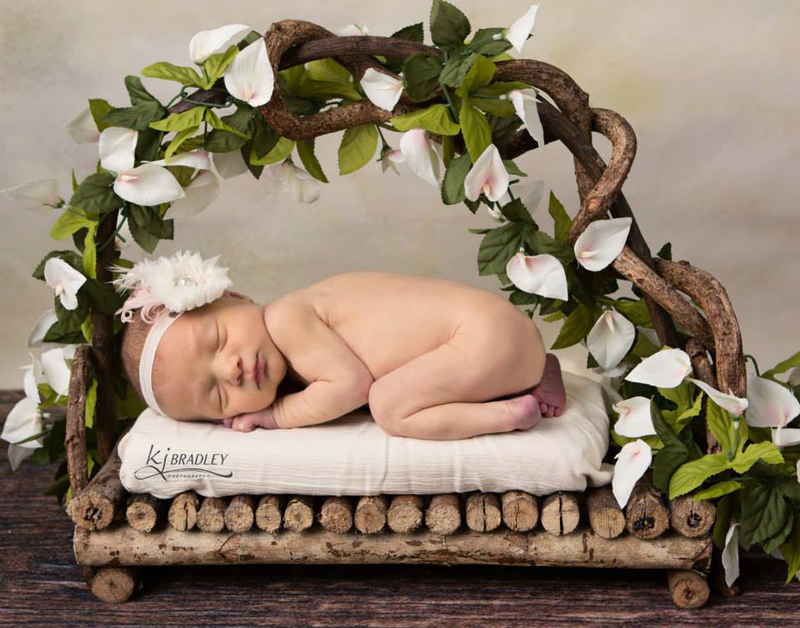 Newborn sessions are held in my home studio. I have a variety of props, hats, blankets, wraps, headbands, and newborn outfits that can be used to match your tastes. Families are welcome to bring special items such as heirlooms, sport paraphernalia and items that reflect your personality. Consult with the photographer in advance if you are bring additional items. 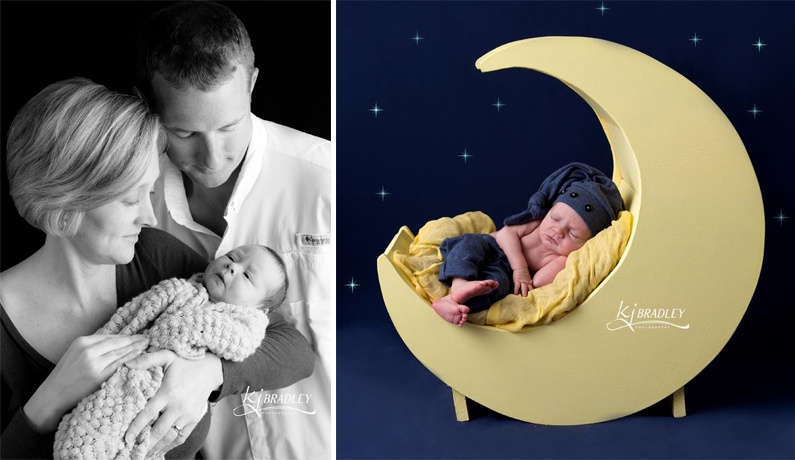 There are different styles of newborn portraits. Some families like to have their babies photographed as they came into the world with no clothing. Others love the props like beds and the moon. Some choose outfits or blankets that match the home decor so that wall art will fit into a certain room. You will be asked for your preferences so take a look through the galleries on my website and online to see what you like. I recommend a mixture of simple photographs on blankets and one or two with props. Newborns sleep best when they are warm and cozy. Prepare for the studio to be very warm. We will conduct the session based on the needs of the baby. Babies often need to be fed, soothed and held more than they are actually photographed. For this reason, sessions can last from 2-4 hours. Babies will be babies. I am prepared for poop, pee, spitup, and more! It happens. 🙂 Be sure to bring extra clothes for the ride home (for you and the baby) and extra diapers, pacis, and any other necessities. Moms and dads are encouraged to be photographed with the baby. I can provide a wrap for a bare shoulders look, or you can bring a solid gown or long sleeve shirt. Be sure in bring your makeup and a hairbrush for touchups. Capturing the relationship between older siblings and a newborn is important. However, the best time to do this in professional portraits is when babies can control their head, usually during the 3 or 6 month session. The newborn session can be too hot and long for young brothers and sisters. If you are planning to include siblings in the newborn session, consider bringing them to the beginning of the session and have a grandparent or friend take them for a special treat when the photos have been taken. As a newborn client, you also have a special opportunity to add a Watch Me Grow package to capture your baby’s first year. This opportunity for studio mini sessions that capture those special stages and smiles in the first trip around the sun are exclusive to VIP clients so be sure to book your next session while you are in the studio. I look forward to this very special time. It comes only once, and I love capturing the newness and creating art for your family!